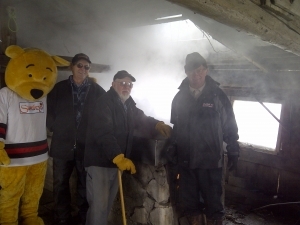 Here at Stanley’s Olde Maple Lane Farm we still boil our sap down the Olde fashioned way! You won’t find any pipe lines or fancy gadgets! We follow the Olde Maple LaneTM tradition and all of our trees are hand tapped with spile & buckets. When they’re full to the top collected by horse drawn sleigh! During your visit be sure to take a trek down the old field stone steps into our heritage sugarshack to visit with Moe & occasionally Grandpa Art to learn the sap to syrup process. Breathe in the heavenly smell of maple & crackling firewood as you listen to the story of how Canada’s favourite sweet treat is made!